3rd day of #AdventBotany – Ilex is the only genus in the family Aquifoliacaeae. 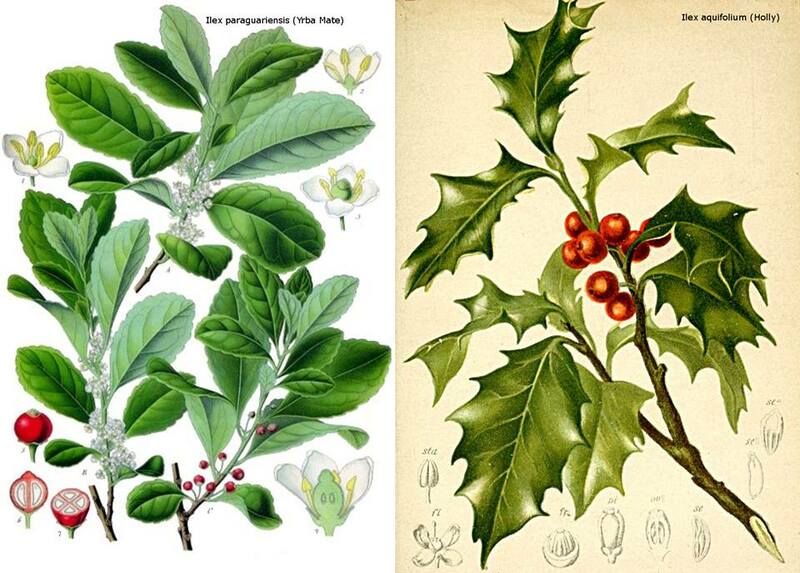 In Europe we know Holly (Ilex aquifolium) which is the third of our Christmas evergreens alongside Ivy and Mistletoe. Holly was brought in to houses in pagan times to keep evil out but was then adopted by Christians as a representative of the crown of thorns at Christ’s crucifixion. However there are around 400 different holly species and many do not have prickly leaves. Ilex paraguariensis is used to make the infusion Mate, the caffeine rich national drink of Argentina. In contrast, Ilex crenata is grown in Japan, China and Korea as a small decorative shrub used in complex topiary displays. Common European Holly has numerous cultivars varying in the pricklyness of the leaves, colour of the berries and variegation of the leaves. Some cultivars are chosen to be extra pricly while others for their distinct lack of prickles. The photos below show three of the Hollies growing in the Harris Garden. Ilex aquifolium and several of its cultivars are RHS AGM plants. A hybrid between I. aquifolium and the tender species I. perado from the Macaronesian islands was bred in 1835 just down the road from us at Highclere Castle and is known as Ilex x altaclerensis. It too has some good cultivars. Holly contains theobromine, the same stimulant found in chocolate. In November 2017 I acted as PhD examiner to a student who brought along a cup of yerba mate to his viva voce to sustain him. Here he is with the well filled calabash of yerba mate. See also DrMgoeswild. For five things you might not know about holly read Plant Life‘s blog. This entry was posted in Advent, Public Engagement with Science and tagged #AdventBotany. Bookmark the permalink.